Feeling lost, unfulfilled, in a rut? Unleash yourself to move forward & discover (or re-discover!) your passion! Ignite that fire within you and become tuned in to your destiny! DISCOVER YOUR PASSION WITH HYPNOTHERAPY!!! This Discover Your Passion Hypnosis MP3 will give you the jump-start you need !!! 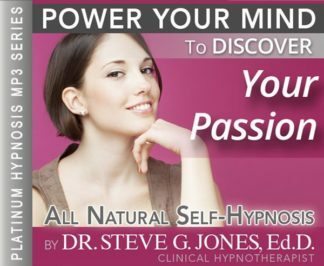 Dr. Steve G. Jones takes you to the next level, puts the wind back in your sails, and helps you discover the passion within you! Steve G. Jones, Ed.D., Clinical Hypnotherapist, charges $1,500 for a custom recording and $25,000 for a one-hour private hypnotherapy session at his office. But you can get all the benefits for this low price. Simply listen to the Discover Your Passion Hypnosis MP3 download every night as you go to bed for three weeks and feel the changes happening in your life. You will feel more empowered, more in touch with your true self, and you will truly know that your goals are within your reach. Steve G. Jones achieves AMAZING and LASTING results!!! Hypnosis is the easiest way to affect change in your life because the positive messages go straight to your subconscious mind effortlessly so you can accomplish your goals and reach for the stars!! All you have to do is listen to the Discover Your Passion Hypnosis MP3 session at night as you go to sleep!!! You’ll hear soft music, the gentle sounds of the beach, and the soothing sound of Steve G. Jones’ voice all working together to bring about positive changes in your life easily and naturally. Steve G. Jones has been helping people improve their lives with hypnosis for over 17 years…now it’s time for him to help YOU… don’t wait, do it NOW !!! you’ll be glad you did. See you at the top! Here is a question I would like you to answer: What is your passion? I like to ask this question to people because I feel that it helps me get to know them better. Some people know exactly what there passion is and they are eager to tell me all about it! Of course they are excited to tell me about it because it’s their passion. But a lot of people are unsure of what exactly their passion is. Your passion is what makes you get out of bed every morning excited to start your day. Your passion brings fulfillment and happiness into your life. Your passion can be your job, a hobby, your family, or anything that you are passionate about. When people discover their passion with the Discover Your Passion Hypnosis MP3 audio, you can tell instantly. They become excited and motivated and happy! This excitement, motivation, and happiness quadruples when they realize how to integrate their passion into their every day lives. Imagine living a life where you are fulfilled by your work or hobby. I encourage you to discover your passion! And as you continue relaxing deeper, deeper, and more deeply relaxed, I would like you now to imagine yourself sitting in a room in your mind and in front of you, you see several television screens. And these screens are showing you doing something different, that’s right. They are showing you doing different jobs or being in different professions or simply doing different things. There are five screens showing you doing five different things. Now we want to discover which one of these is showing you doing what you are most passionate about. So as I continue speaking now, one of the screens goes blank. This is the screen which shows you doing something which you are least interested in doing out of the five things. So now one of the screens goes blank because you weren’t really that interested in doing that thing at least not compared to the other four things. So now all you see are four screens, the other screen just goes away and you see yourself doing something different in each of the screens. And as you see yourself in those screens, really pay attention to what you are doing on each screen. You are doing something in each of them and as I continue talking now, another one of the screens goes blank because that screen was showing you doing something which was not as exciting for you as what the other screens were now showing. So now the fourth screen has gone blank and now disappears completely and you only see yourself in three screens and in each of those screens you are doing something whether it is a job, profession, or just something. Now, as I mentioned you want to decide which one of those things you are most passionate about and I am here to help you by eliminating screens that don’t belong. That is my role. Your role is to make the ultimate decision, which of these things are you most passionate about? So in a moment one of the three screens will become very large and actually push the other two screens out of your sight. That screen will be the thing about which you are most passionate. I am going to count down from three to one and when I reach the number one, one of the screens will become large and the two others will be pushed out of your sight. 3…2…1. And now you see in front of you your passion. And you will remember this. You will remember your passion. I want you to imagine yourself six months from now having pursued this passion, having taken the steps necessary to develop this profession. Whether it is a job, a profession, or something you want to do, six months from now. Now I would like you to look back to the present from six months in the future. Notice all the simple and easy steps which were necessary to get you from where you are now to six months in the future when you are enjoying that passion, when you have developed that passion. See all the steps easily, laid out in front of you. And now as you come back to the present, you realize that you will take those steps to fulfill your passion. You will do this easily. And you will enjoy doing it because that thing that you saw, whatever it may be, is your passion and you will pursue your passion. It will almost seem effortless because you enjoy it. So relax now and realize that everything is going to be just fine.